The holidays have come and gone, and the team at Stoner Bunting just capped off a year of growth and client successes. While 2017 might be young, it’s about to get rather busy with the official start of trade show season for the home and building product industry. First up on the list is Design & Construction Week (DCW), the mega-show that brings together two very different yet complementary groups of residential professionals for three days of sharing, learning about and experiencing the best of the best. 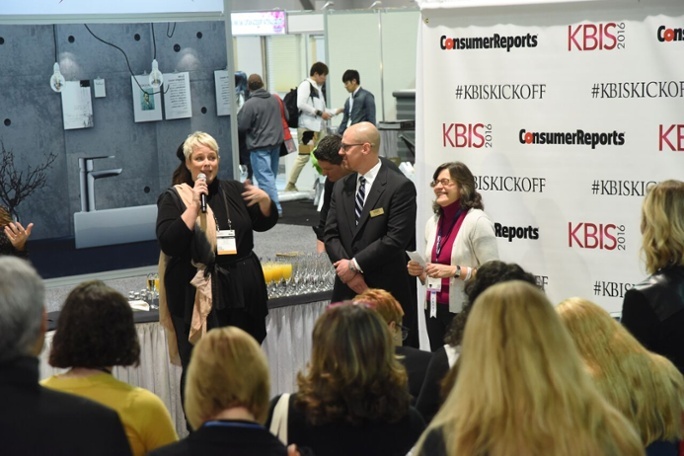 As we make final preparations for DCW we wanted to share more about the unique role that the co-located Kitchen and Bath Industry Show (KBIS) and International Builder’s Show (IBS) play in our industry. Prior to 2014, KBIS and IBS were completely separate shows with overlapping audiences. Since combining forces, each show still attracts a unique set of audiences, but the crossover has been even larger than expected. While there are a variety of reasons for this, the most relevant and important is that the larger design and construction industry has seen its silos torn down. Designers want to learn and understand the contractor/builder world and vice versa. Average attendee plans to specify/purchase $2.4 million this year with exhibitors. IBS, on the other hand, is the largest annual light construction show in the world, attracting more than 60,000 visitors from 100 countries. It brings together the industry’s most important global manufacturers and suppliers and showcases the latest products, materials and technologies involved in all types of buildings— including wood, concrete, stone and brick. The show is also home to the “IBS Centrals”, physical breakout spaces scattered throughout the floor that allow attendees to explore new ideas, refine skills and gain business information about specific niches in the building industry. Six main Centrals are open during the three days of the Builders’ Show, and each Central has a specific area of focus within the building industry with its own separate schedule of events. Additionally, the programs held inside the Centrals are a bit more informal than traditional IBS Education sessions, and feature some of the best professionals in the industry who are passionate about their area of expertise. Topics include 55+ housing, custom home-building, designing for multi-family units, remodeling and more. Well, we have two clients going to DCW this year. And we’re super excited about it. CertainTeed Corporation will be out in full force with all four of its residential brands represented on the IBS floor. This includes CertainTeed Siding, Roofing, Gypsum and Insulation. As you might remember, we had great success with CertainTeed Gypsum at last year’s show, owning IBS and DCW buzz with the comprehensive, PR and marketing-driven launch of Habito. We anticipate great things for this year as well. Over at KBIS, we will also be on site with Belwith, a decorative hardware brand that has been a leader in design, craftsmanship, and innovation since 1893. A new client win for Stoner Bunting at the end of 2016, KBIS will be our first trade show with the company and we look forward to showcasing the brand’s full range of cabinet hardware, furniture hardware, architectural door hardware and wall plates. CertainTeed and Belwith are just two of thousands of brands that will be represented at DCW in Orlando. Although they occupy completely different spaces in the market and in the end-users mind, their places at IBS and KBIS are a perfect reminder as to why these shows came together in the first place. Kitchen and bath designers, who help clients choose everything from cabinets to hardware, want to know what drywall, flooring products and finishes are best suited to their designs. They also want to learn how building product companies prioritize efficiencies, saving time and money for them and their clients. Builders and contractors, on the other hand, need new insights into how the design world thinks and operates, and how they can better communicate and foster relationships to up-sell products to clients and homeowners. While this might be a simplified viewpoint, it is indicative of larger trends. Silos have been torn down across the industry, and these shows have helped to create a new world of shared knowledge, understanding and learning. As DCW continues to grow and expand, its founding partners will continue to drive possibilities of residential design and construction. This synchronization of trade shows and markets will have direct benefits for everyone involved in the industries and the best is truly yet to come.